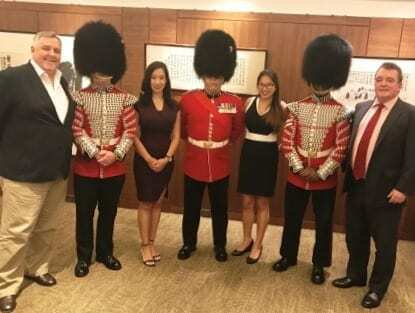 Tanner De Witt was pleased to be invited by the British Legion to host three members of the Welsh Guard for lunch at The Hong Kong Club on Wednesday 14 June. The Guards were in Hong Kong representing the British Army and participating in the Queen’s Birthday Celebrations in Hong Kong and Macau. Partners Ian De Witt and Jeff Lane were joined by solicitors Veronica Chan and Tara Chan. Tanner De Witt is proud to support the British Legion’s activities in Hong Kong as evidenced by our annual Poppy Appeal.